April 8th 2018 - ATLANTIS, Fla. – This weekend, the South Florida PGA Junior Championship Tour presented by The Honda Classic held Championship Tour Event #3 at Lost City Golf Club in Atlantis, FL. After high winds in the opening round tested everyone’s skills, Sunday’s final round was washed out after strong storms rendered the golf course unplayable. Nicholas Estrada of Lake Worth, FL fired a two-under par 70 to capture the overall boy’s title. Estrada’s round featured four birdies to just two bogies. Lake Worth resident Tyler Stachkunas took home the boy’s 13-15 age division after a round of 72. Jupiter resident Troy Stribling took home the boy’s 16-18 age division after a round of one-under par 71. After round one, four girl’s found themselves tied at the top of the leaderboard. After Sunday’s final round was canceled all four girls were crowned Champions. 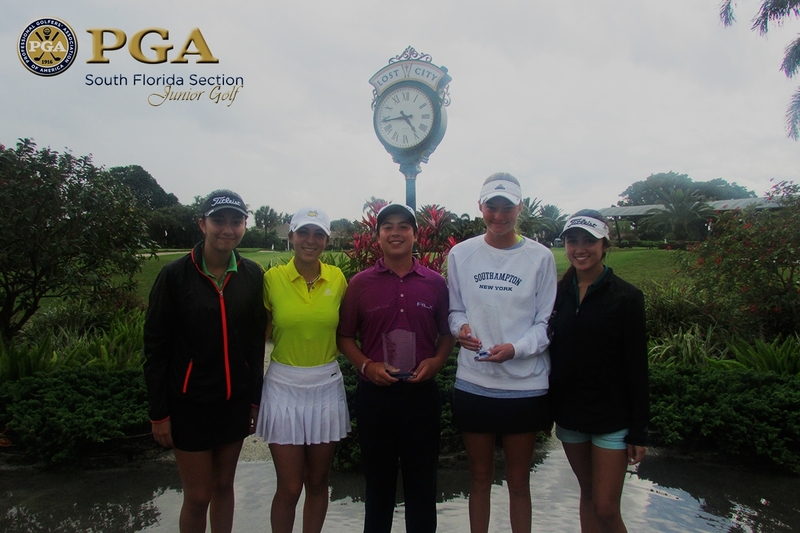 Nicole Cee of Port St. Lucie, Isabel Herrera of Wellington, Jenna Fonda of Wellington, and Amelie Alcantara of Plantation each fired rounds of two-over par 74 to capture the overall girl’s title. Skylee Shin of Doral took home the girl’s 13-15 age division, while Brianna Farrell took home the girl’s 16-18 age division.